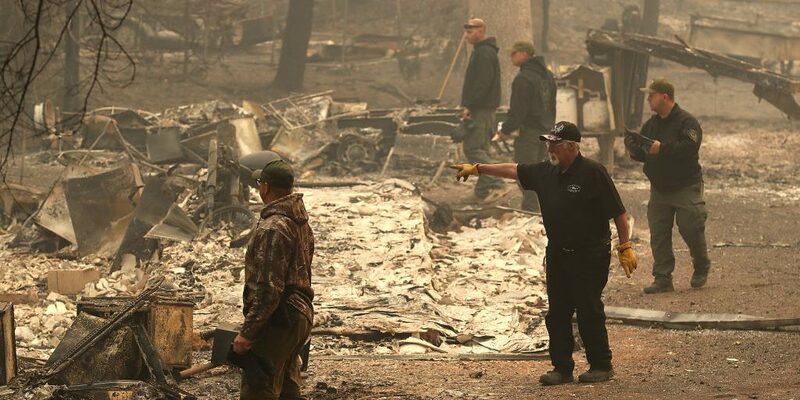 The Camp Fire, which is now California’s most destructive wildfire based on structures destroyed, has all but completely obliterated the town of Paradise, Calif.
It’s estimated that the Camp Fire destroyed about 80 to 90 percent of the homes in Paradise, CNN reports. “There’s really not much left. There are very few homes still standing and we’ve been in multiple different neighborhoods this afternoon,” Paradise Mayor Jody Jones told CNN. The Camp Fire started on Nov. 8, and in less than one day, the entire town of Paradise was evacuated, according to Time magazine. “We’re grateful that we got people out as quickly as we did yesterday, but we have a lot to do, to rebuild,” Jones told CNN. Butte County, Calif., in which Paradise lies, is facing multiple issues of its own in the wake of the Camp Fire’s destruction. The county had a housing vacancy rate of between 1.5 to 2.5 percent, but the fire had destroyed about 15 percent of the county’s housing at four days into the fire’s existence, the Chico Enterprise-Record reports. Additionally, Butte County has faced a wave of looting in the days since the fire started burning, according to the Enterprise Record. The county received 53 reports of suspected looting within three days. One of the major worries in the county is that Paradise residents may not return after the fire is put out, according to the Enterprise-Record.